This spectacular, fast-growing, flowering cherry tree variety has many unique qualities that would make it a perfect addition for your yard. The Autumn Flowering Cherry Tree also known as the Autumn Blooming Higan Cherry is famous for the ability to produce lovely pink buds and white flowers off and on during a warm autumn season and then fully flowering in the spring. The showy, ¾" semi-double, 10-petal flowers go through a multitude of color changes bud to full bloom to fading. Deep pink in bud, turning to light pink when open and fading to almost white when fully open. This quality alone would make it a landscape standout by adding color to your yard in the fall season. In addition to potentially two blooming seasons, this cherry tree has reliable fall foliage turning bronze, yellow, gold or deep-red tinged, pea-sized black berries for wildlife, and an attractive bark for winter interest. The delicate upright branching is broad and spreading, often as wide as the tree is tall. 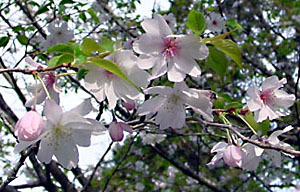 It is more cold-hardy, heat and stress tolerant, and long lived than other ornamental cherry trees. All this makes it a good choice for landscaping needs. Acidic, moist, well-drained, loam, clay. Full Sun to Partial Shade. 20' to 30' high with a 15' to 30' spread. Currently shipping Trees that are approx. 6-14" in height. Shipping in a 3 inch pot. Special Note: The Autumn Flowering Cherry Tree is one of several cherry trees in the Tidal Basin of Washington DC. This area is the focus of the National Cherry Blossom Festival.